Breakfast is considered to be the most important meal of the day. Start yours off right with a plateful of the mouthwatering morning favorites from our complimentary hot breakfast bar. 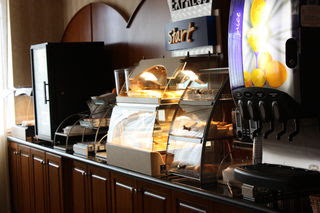 The breakfast bar includes items such as sausage, sausage gravy, cheese omelets, biscuits, grits, cold cereal, hot oatmeal, muffins, bagels, French toast, waffles, croissants, cinnamon rolls, boiled eggs, yogurt, fruit cups and applesauce. The breakfast bar is open on weekdays from 6:30am – 9:30am and on weekends from 6:30am – 10:00am. If you’re staying at the Holiday Inn Express & Suites, Warrenton, VA please be sure to check out this wonderful free amenity!